As part of the Agilent Santa Rosa site’s sustainable weed-abatement program, goats and sheep now roam the site under round-the-clock supervision by a team of shepherds. About 150 animals live on the site now; up to 900 are expected to graze at the height of the fire season. They will stay until the end of summer. A third-party business, based nearby, owns the animals and manages the service for Agilent. The grazing animals and the dogs that herd and protect them are enjoyed by employees and visitors at the facility. Comments such as “serene,” “grounding” and “peaceful” are common among those who spot the goats and sheep traversing the 190-acre site. Using animals to maintain vegetation costs less than doing so with tractors, mowers, weed whackers, etc. The animals graze around the clock, for example. And while machines may not be used in extremely hot weather due to “Spare the Air” days and risk of sparks, the heat poses no problem to the goats and sheep. Efficiency is another advantage: When at full force, the animals will consume more than a ton of vegetation a day. Animals also impact the land more gently than machinery. Grazing preserves soil by maintaining the root systems and structural vegetation that holds soil, so erosion is minimized. 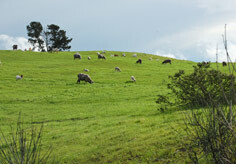 Santa Rosa’s goats and sheep are contained in temporary paddocks that are reconfigured to suit terrain and vegetation changes. Facilities contractor Johnson Controls oversees the sustainable weed-abatement program and ensures that site fire breaks are maintained.